At 7,122 feet, Wilson Mountain is the highest of the red and white sandstone peaks surrounding Sedona, so its upper slopes provide the best elevated views of the area. The top is a grassy basalt plateau about 2 miles across, rather than a discrete summit, and may be reached from two directions, via steep trails that converge half way up and continue to a second junction in woodland on the plateau. From here one branch goes south to an overlook of Sedona and lower Oak Creek, while the other, longer path leads to the north edge of the plateau for an equally fine panorama of upper Oak Creek. 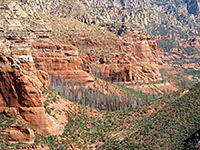 The shorter of the two approach routes still involves a round trip of 8 miles and an elevation gain of 2,200 feet (add one mile and 250 feet for the alternative), making this the most strenuous hike near Sedona, but the effort is rewarded by beautiful scenery and relatively few other hikers. Wilson Mountain topographic map, Sedona location map. 11 views along the Wilson Mountain Trail. South edge of Wilson Mountain, overlooking Sedona, Oak Creek and Munds Mountain. Most of Wilson Mountain is within the Red Rock Secret Mountain Wilderness, and the two trailheads are subject to Coconino National Forest regulations, including the requirement to pay $5 per day for parking (the 'Red Rock Pass'); a self-pay machine is located at each trailhead. The northern route is the North Wilson Trail (#123), which starts from the Encinoso picnic area along AZ 89A, 5.3 miles north of the AZ 179 junction in Sedona. The southern route (Wilson Mountain Trail, #10) begins next to Midgley Bridge, 1.9 miles from the junction. Both parking lots are fairly small and may fill up on busy summer days though the majority of people are here for picnics and short walks along Oak Creek rather than the long climb to the top of the mountain. From the Encinoso picnic ground, the North Wilson Trail climbs a wooded slope beside a dry creekbed, up to a ridge overlooking the parking lot and the highway, then crosses a small grassy area before turning away from the road into woodland, still close to the dry wash. The Douglas fir and ponderosa pine forest was severely burnt in a 2006 wildfire, though most of the dead trees are still standing, rising above several feet of thick new growth on the valley floor. 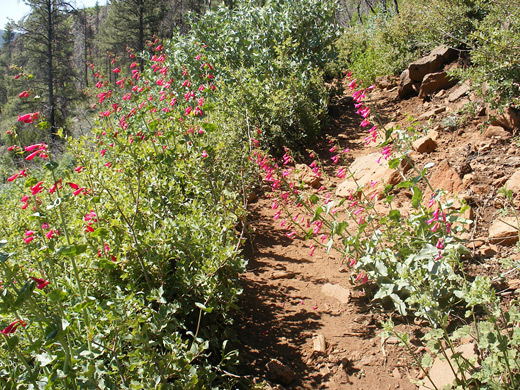 The path stays straight and not too steep for half a mile, heading towards the vertical white and orange cliffs that form the west edge of Oak Creek Canyon. The trees become thicker around the base of the cliffs, where a patch of the original woodland survives, and the trail runs through this shady area for a short distance, veering southwards a way then starting a long climb via many switchbacks. This is the steepest part of the whole route, gaining nearly 1,000 feet in less than a mile, up the side of a bench at the edge of the main mountain. The slopes are covered with trees and small bushes, tall enough to give a fair amount of shade in the mornings, though the path is narrow, rocky and slippery owing to loose stones so some care is needed. Once near the top of the bench the trail straightens and completes the ascent through another patch of burnt trees mixed with new vegetation. The views are already quite good, west towards the mountain and east over the densely-wooded canyon of Oak Creek. The route continues southwards over open grassy flats and reaches the junction with the alternative (2.8 mile) path from Midgley Bridge, 1.8 miles from the starting point at the Encinoso picnic area. Unlike the largely wooded and sheltered North Wilson Trail, the southerly route (the Wilson Mountain Trail) is much more exposed though equally steep, winding across sunny slopes bearing typical chaparral vegetation including manzanita, yucca, cacti and oak. Past the junction, the trail heads directly towards the mountain, bending north then south and finally north again, climbing the bushy hillside up to a shallow ravine at the edge of the plateau, which is followed to a saddle in a wooded area, where the path forks. Some parts of the ascent are through thick groves of new trees that will need regular trimming to keep the trail from becoming overgrown. The junction is next to a metal box (containing firefighting equipment) chained to a tree, and a sign which indicates the two choices - Sedona Overlook (0.6 miles) to the south or North Canyon Overlook (1.7 miles) to the north. 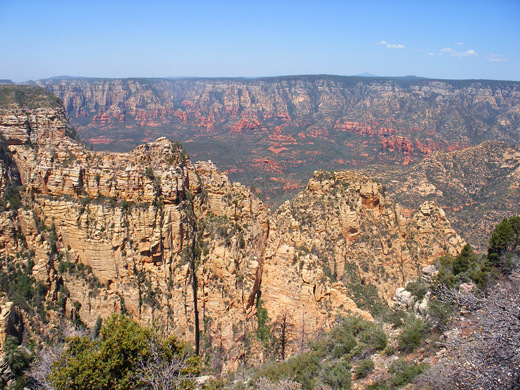 Sedona Overlook is reached by an easy walk through sparse, burnt woodland, leading to the viewpoint right at the rim of the sheer cliffs on the south edge of Wilson Mountain. The mostly treeless rim allows unobscured views all around (see 360 degree panorama) including of Sedona, the lower few miles of Oak Creek, the north face of Munds Mountain and south to the distant Verde River Valley. 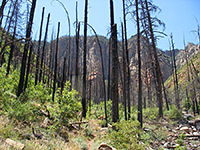 The longer walk to the North Canyon Overlook starts off through another patch of fire-damaged woodland where many trees have fallen and blocked the original route, so the path winds around the blackened stumps and logs, its course not always obvious. Next is an open section over a grassy plain, followed by more trees, this time still alive and unburnt. The trail ends at another fine viewpoint high above Vultee Arch and Sterling Canyon, with upper Oak Creek Canyon just beyond and the San Francisco Peaks on the horizon (see panoramic photograph). Tall trees grow along the rim so the vista is not quite as extensive as at Sedona Overlook though just as good. 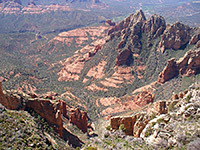 The most extensive area of red cliffs and buttes around Sedona lies to the west, out of sight of both overlooks, but some can be seen by a short cross-country walk, leaving the path a few hundred feet south of the North Canyon Overlook; from the plateau edge much of upper Dry Creek valley is in view, behind the steep slopes of Lost Wilson Mountain.